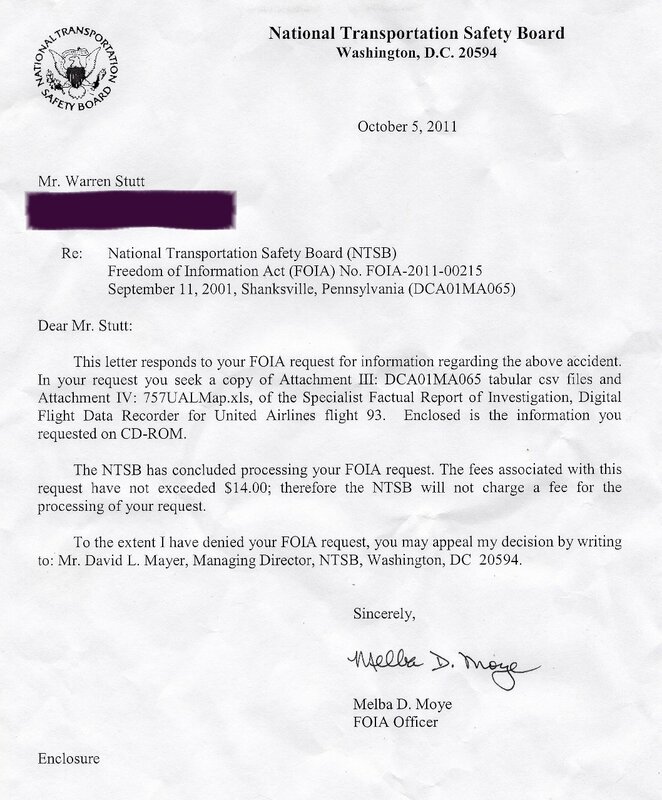 On 28th July 2011, I sent a Freedom of Information Act (FOIA) request to the United States National Transportation Safety Board (NTSB) through their online request web page concerning the Flight Data Recorder (FDR commonly called "black box") file for United Airlines Flight 93 (UAL93). My aim was to get a copy of the original FDR file and the data frame layout used in the file. I received a CDROM containing them. The data frame layout (757UALmap.xls) is available here. There is also a file that I received in reply to a previous FOIA request, D226A101-3G.pdf which is a Boeing document containing generic data frame layouts and information on how parameters are recorded which is available here. An ISO image of the entire CDROM I received from the NTSB is available here. Thank you for your response to my previous FOIA request number 2009-00078. I have a new request which involves NTSB Number DCA01MA065 which is the crash near Shanksville, Pennsylvania on September 11, 2001 of the B-757-200 aircraft registration number N591UA operated by United Airlines. Footnote 1 on page 2 of the "Specialist's Factual Report of Investigation Digital Flight Data Recorder" document of February 15, 2002 made available online by the NTSB at http://www.ntsb.gov/doclib/foia/9_11/UAL93FDR.pdf refers to Attachment IV: 757UALMap.xls. Page 3 of the document also lists Attachment III: DCA01MA065 tabular csv files. I request a copy of each of these attachments. The "Specialist's Factual Report of Investigation Digital Flight Data Recorder" document I referred to is available from the NTSB here. 22/09/2011 11:58 PM <DIR> . 23/09/2011 12:10 AM <DIR> ..
21/03/2007 06:45 AM <DIR> .